Our concentrated herbal remedies are more intense than many other kinds on the market. We use organic or wild-crafted Echinacea Augustifolia & Echinacea Purpurea in our tinctures, which give you the tongue "tingle" associated with potent high-quality Echinacea. TAKE ADVANTAGE OF OUR EARLY SEASON SALE! Keep your defenses strong through the changing seasons! Try one of our 6 Echinacea tinctures - or all of them. 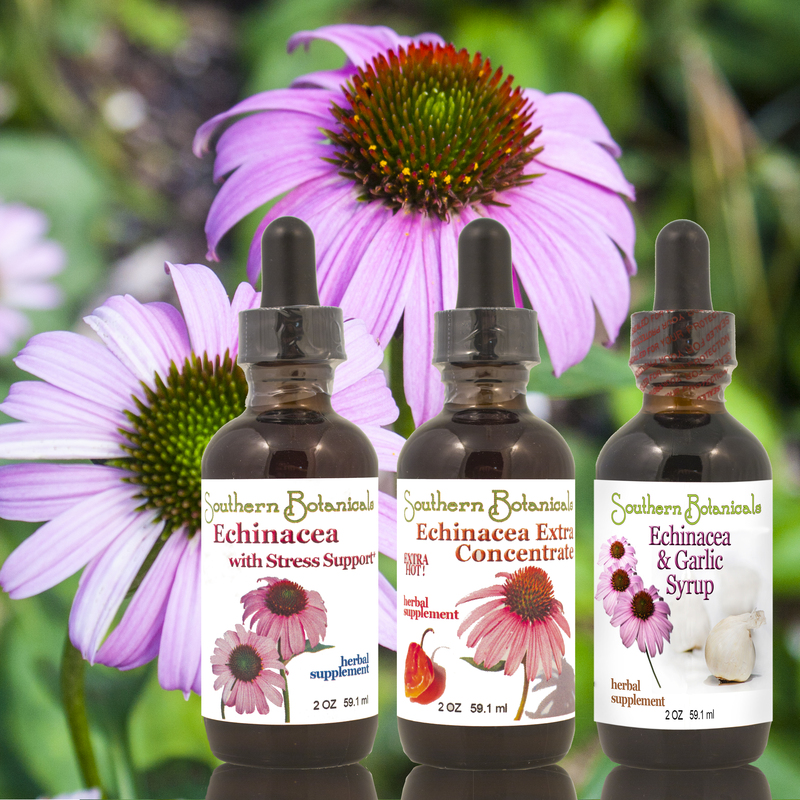 Take any of our echinaceas, 1-2 droppersful one to three times a day - take one week on, then one week off throughout the Fall and Winter Season to help you keep going strong. You can also alternate, choosing a different kind of Echinacea each week or month. Our popular Echinacea Extra is hot & spicy and most effective! The extra Cayenne boosts circulation to send its herbs throughout your body. It also can make a great health gargle. Echinacea & Garlic Syrup goes down smooth and sweet in an easy-to-take delicious California fig syrup base, but has a powerful result. Echinacea with Stress Support includes Eleuthero, an adaptogen for energy and stamina, to have strength to meet challenges when you need it. Sinus Support contains Echinacea and Goldenseal plus 7 other great supporting herbs. It is strong and potent, but not tasty. Echinacea Syrup for Adults combines the immune support of Echinacea with the stress-relieving power of Eleuthero, in a naturally sweet fig syrup when you want comfort. Don't forget Echinacea Syrup for Dogs for your furry friends who may need immune support too, especially if they are older. Echinacea Syrup for Dogs provides immune support plus Eleuthero, an adaptogen for stamina, in tasty organic fig syrup. CHOOSE FROM OUR GREAT ECHINACEAS - ON SALE!